Polymer specialist REHAU and 13 partners are investigating OLED lighting technology, an innovative new lighting technology, which allows for lighting to be uniform, bendable, ultra-thin and transparent. REHAU’s involvement is part of the European programme called Lyteus, which is establishing a pilot line enabling companies of any size to develop concepts related to flexible OLED lighting technology quickly and cost-effectively and to bring products to market maturity. REHAU’s role in the consortium is to validate the pilot line as a launching customer, along with AUDI AG, Pilkington and emde design. The research activities are supported by the European Commission through the Photonics Public-Private Partnership with a total of 14 million Euro. “In this project, REHAU is venturing into the market of printed electronics. With our know-how in the processing of polymer materials, we are trying to integrate OLED films into edgebands and profiles,” explains Dr.-Ing. Constanze Ranfeld, Corporate Research & Development / Advanced Technologies at REHAU. If the project is successful, these profiles could light up aircraft cabins, for example, as a design highlight. Moreover, the advanced, film-based and therefore flexible OLEDs could be used for numerous other application areas. The polymer specialist can also see possible applications in the automotive sector. REHAU demonstrates the new design freedom, which OLED lighting brings, in its technology carrier Smart Backend. 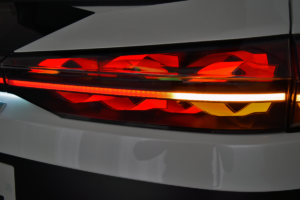 On the rear of the vehicle, the films have been integrated into the lights in a spiral and thus created a unique optical effect. The integration of OLEDs into REHAU products fits perfectly with the strategic direction of REHAU. The aim of the company is continuous development. The polymer specialist invests in innovative technologies, in order to be able to supply high-quality and high-tech products to its customers. There are however, commercialisation obstacles, which must be overcome before the technology reaches the mass market. 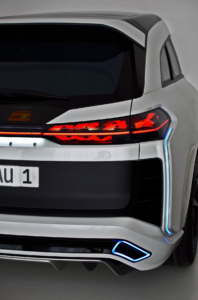 Two of which are price intensity and limited availability: “OLEDs could become the lights of the future. Initially, however, technology scale up and commercial price points must be achieved,” Ranfeld emphasises. Lyteus is helping companies such as REHAU to bridge this gap. Integration into windows would also be conceivable. “Panes of glass that are transparent in the daytime and light up the room in the evening are visions for the future, though,” the developer explains. Polymer specialist REHAU makes sustainable contributions to the ecological and economic challenges of tomorrow. Over 20,000 highly qualified employees all over the world are committed to this. For 70 years, outstanding innovations, the latest production technologies and flexible logistics have made the independent family company a forward-looking and reliable partner with expertise for almost all economic sectors. Focal topics are mobility, energy-efficient construction, digital transformation, future living and water management.